This wooden sun deck we built in Westville Durban was designed to try to maximise outdoor space. The house we built it at had very little outdoor space as it was situated on a steep plot. You can see from the pics that before we built the wooden sun deck, the garden had only a small area of about 1m around the pool on the front side of the garden. There was then a steep concrete staircase down the side of the house going to the back garden. The back garden was however not very usable as it was far from any entrance to the house. 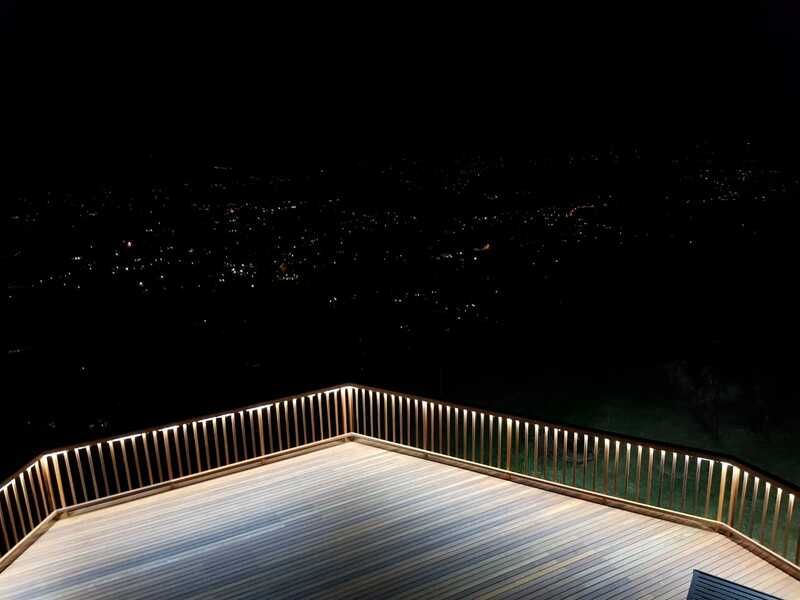 So the idea here was to build a wooden sun deck that extended from the slasto of the pool area to meet the far side of the house. 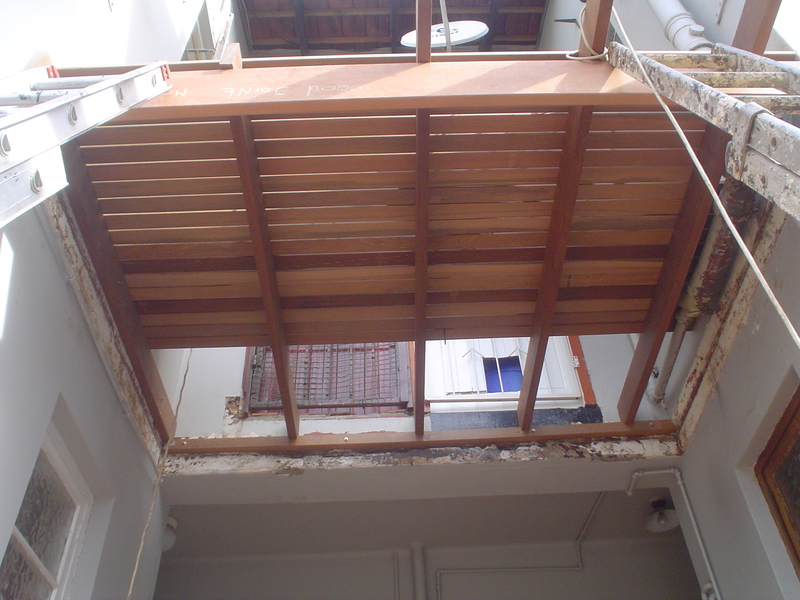 It was about 48m² in total floor area and was surrounded by a wooden balustrade in a picket design. We left the existing concrete stair case in place and built the wooden sun deck so that one could use this existing stair case. Hence the U Shaped deck. We also had to split the wooden sun deck into two levels as the area by the pool was a little lower than the area where it met the existing concrete deck. So we had a split level deck with a small step up of about 180mm. 180mm is always a good step height or riser height. The posts beneath had also been lined up so as to avoid being placed in the middle of the stair case. Even though the outer posts were some distance from the bottom of the stairs, if we had placed them where they would normally have gone (i.e. equal distances from either end) then it would have spoilt the line of sight as one was walking down the stairs. So they were shifted slightly left and right to miss the line of the stairs. We also had a garden shed beneath the front edge of the deck so we had to build around that which had had a new roof built on it and waterproofed. When building over waterproofed structures one cannot drill through the torch on as it will results in leaks beneath. You need to then build on either side of it or use thicker beams and joists to be able to span them further apart. In the pics on this article you can also see the horse shoes we used to support the beams on the walls. Instead of dropping posts to ground you can simply attach the beam to the wall by cutting a horse shoe using the same timber as the beams. The bottoms are always cut to 45° for both neatness and to avoid having sharp corners jutting out. This also applies to the ends of main beams. We treated our cut ends with Permaseal, an approved end sealer used to stop rot or insect damage to cut ends of CCA treated timber. This was necessary in order for us to activate the 50 year guarantee that the supplier provides on the CCA Treated pine substructure. There are a few articles on this blog that go into detail about this and what is required in order to activate your 50 year guarantee. For a free no obligation quote on wooden sun decks, wooden floors or wooden fences, please contact us on 031 – 762 1795 or use the contact us form below. 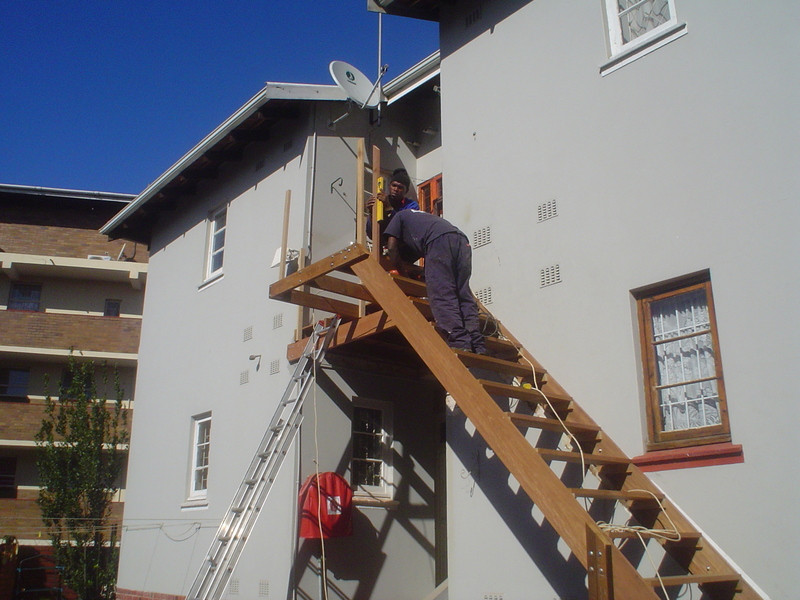 This wooden stair case build by The Wood Joint in Durban was a tricky one. 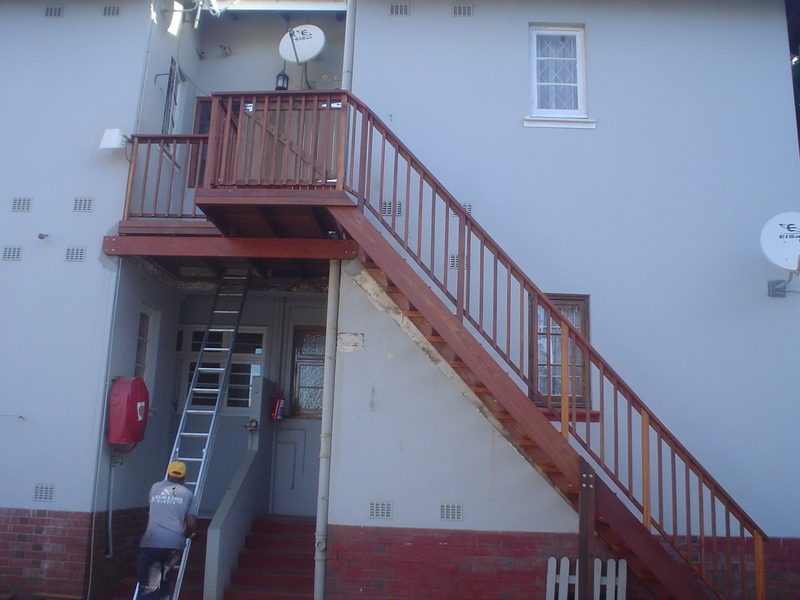 The client was a committee member on the body corporate for a small block of flats in Durban. There were about 4 units in the block and the existing steel fire escape had rusted to a point where it was unsafe. So first we had to remove the steel structure. With a little help from my friends, we came in and chemical anchored stainless eyes into the wall on both sides above the steel platform you see in the pics. From there we rigged up some climbing equipment to be safe and started cutting sections out of the steel structure and lowering them slowly to the ground. We had to cut small sections as the steel was 10mm thick and we didn’t want to damage the walls, windows or doors on the way down. We managed to get most of it down in one day with a small piece remaining for day two. We battled slightly in getting the main support off as the sewage pipes had been installed after the steel so we had to cut the steel out around the pipes so as not to damage the pipes. In removing it we inadvertently damaged a corner of the wall as the rawl bolts there were quite large, rusted and pretty much part of the building by now. We patched that using structural grout which was hard and strong enough to support our main beam to. With the steel gone, we set out to build a wooden stair case and landing that could act as a fire escape. The small landing part was easier enough and we canter levered it so as to keep our posts out of the way below for parking. 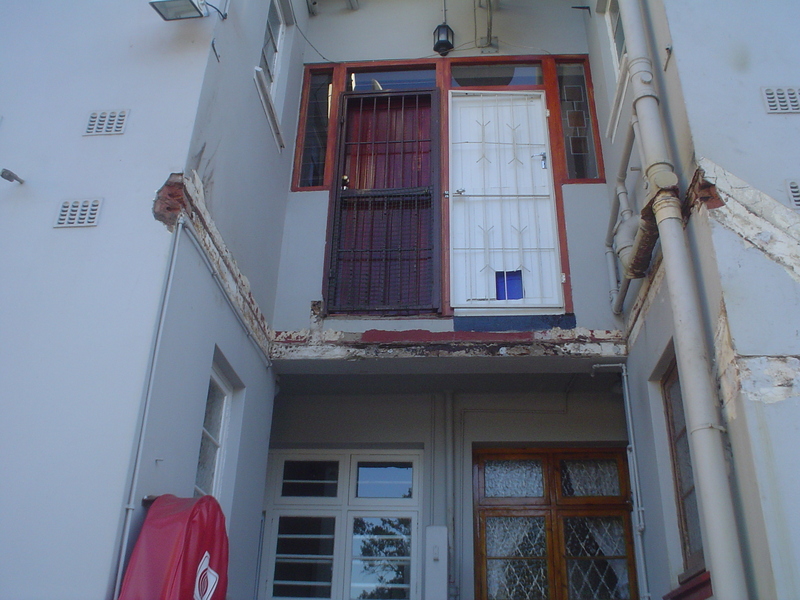 In these smaller blocks of flats in Durban space is very limited so posts need to be kept well out the way of parking space. Because we were canter levering it we needed to use 30 x 140 joists of balau rather than our normal 30 x 102 joists. The stringers for the stairs were also tricky as we had to follow the original line of the stringers because there was a window beneath that we couldn’t cover and we could only protrude to the end of the wall without obstructing the driveway. This resulted in our stringers being placed at 45 degrees which resulted in our risers being of equal length to our runs or treads. 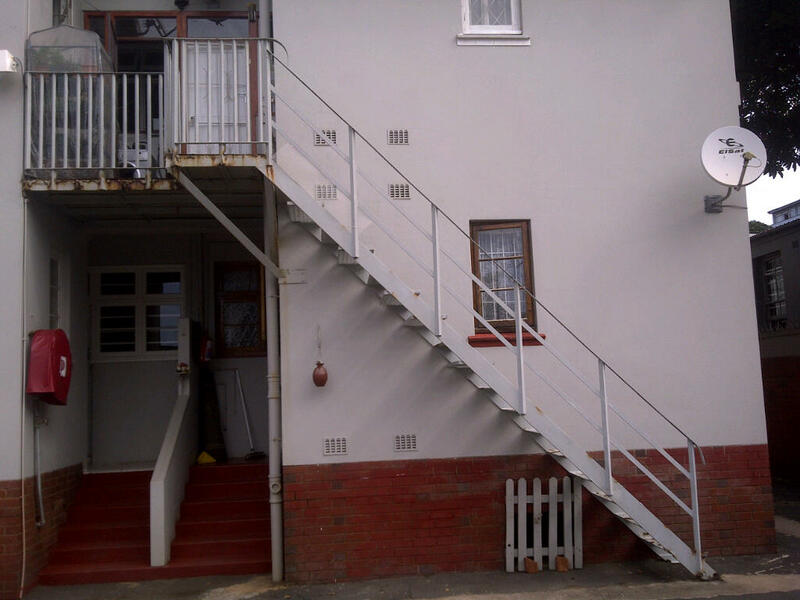 It is not ideal as it makes the stairs very steep but we had no option due to space and height. We were a total of about 4m in the air to the landing. The treads went on alright, the balustrade too and we had to join the stringer on the outside with two independent posts to ground to support it as the timber we could get wasn’t long enough to run the full length of the stringer. We went back there a year or two later as one of the treads had popped a screw. Sometimes the timber moves more than one wants it to and breaks the screw off. We do however put additional back up screws in each piece we secure so they are safe in the event that one screw does break. For a free no obligations quote on wooden stairs or any other outdoor timber construction please complete the form below or you can call us on 031 – 762 1795.